Independent assessors are to examine the use of restraint at Australia's leading autism service in the aftermath of a scandal involving a large box built to lock up people with disabilities. The Andrews government will order the independent review at Autism Spectrum Australia (Aspect), one of the country's largest disability organisations, to scrutinise staff's use of restraints on clients. Adverse findings could lead to the termination of state government funding, which amounts to $4.8 million for the 2015-16 financial year. It comes as the government moves to reduce the use of restraints on people with disabilities in special schools, including physical force, mechanical restraint and locked confinement. The Department of Health and Human Services said the independent review into Aspect would not be conducted until an ongoing Victoria Police investigation was finished. 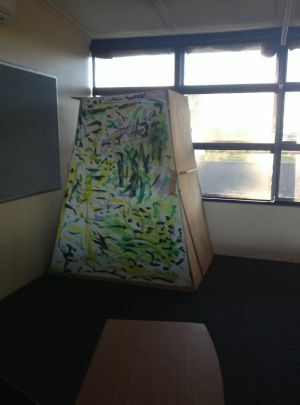 Authorities took action two months ago after Fairfax Media revealed the existence of a "coffin-like" box built to lock up distressed clients at Aspect's day centre in the Melbourne suburb of Heatherton. "The department has completed [a] quality-of-support review into unrelated matters and intends to conduct an independent review, which will look at the organisation's use of restraints," a department spokeswoman said. Detective Inspector Bernie Edwards said police were taking witness statements as part of a criminal investigation into Aspect. Police inquiries are understood to be centred on serious allegations of staff-to-client abuse. A separate probe into the box, launched by Victoria's Disability Services Commissioner, has been put on hold while detectives carry out their investigation. The two-metre-tall structure, described in internal Aspect documents as a "desensitising box", was intended to be used as a calming device for the centre's 16- to 50-year-old clients, most of whom are unable to talk. It was to have egg cartons fitted on the inside for soundproofing and clients had begun decorating the exterior. Whistleblower Karen Burgess said she ordered the box be dismantled after taking over as site manager at Heatherton earlier this year, but said that staff ignored her. It was taken down only after being referred to the organisation's Sydney head office. The box was at the centre for months after Aspect took control of the site from another service provider. Aspect chief executive Adrian Ford said the organisation was co-operating with authorities. "Aspect remains committed to being completely transparent about the high standards we maintain and our evidence-informed practice with people on the autism spectrum," he said. An internal investigation found no evidence the box had been used, Mr Ford said, but the organisation neglected to report it to authorities, including the DHHS. Aspect has not apologised for the box scandal and the two staff members who built the structure were allowed to resign. In October, Victoria's disability minister Martin Foley said he was "horrified" that the box existed and directed his department to urgently inquire about it as part of the government's quality-of-support review already underway into a separate matter at Aspect Heatherton. The government has previously flagged it could slash Aspect's funding if adverse findings are made by the external consultant. Disability advocates and parents of special-school students have long been voicing concerns about the use of restraints, saying it violates human rights. A Canberra principal recently lost her job after approving a cage for a 10-year-old autistic boy, and further allegations of forced restraint have been made against two Victorian special schools. New measures have been introduced requiring teachers to report every instance where they believed it was necessary to use restrictive interventions, and appointed a new state officer work with schools to monitor responses to children with behavioural issues.